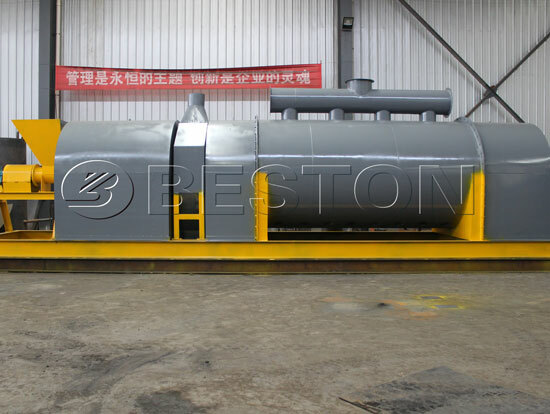 Beston wood charcoal making machine is mainly used to process the wood chips into renewable energy – wood charcoal, and it mainly has adopted the high temperature carbonization technology, so it also can be called wood pyrolysis plant. With the continuous innovation and research, the machine has possessed the remarkable features: mature production technology, stable running structure, easier to operate. As for the end products, wood charcoal has high caloric value and fine density, so it always can be used in industrial melting, daily warming and barbecue. 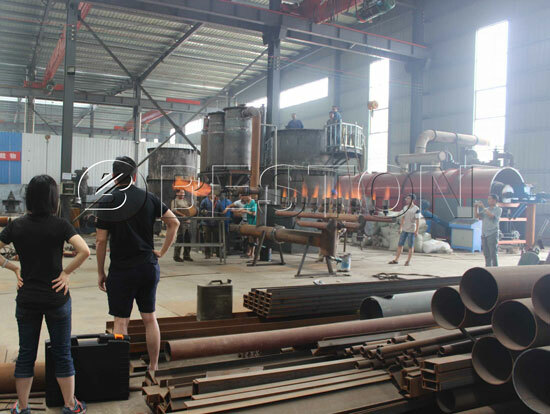 For the purpose of high working efficiency, our professional technicians have always focused on adjusting the structure of wood charcoal making machine. 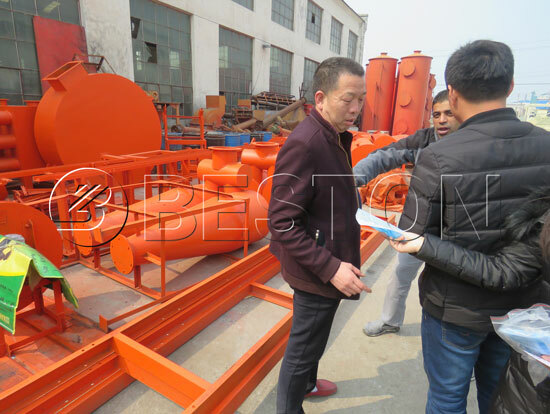 Beston wood pyrolysis plant has been equipped with the top-rate carbonization furnace, well refrigerating system, efficient spay dedusting machine, refined condenser system. Next, we will guide you to know how each part of the machine works. 1. Carbonization furnace: carbonization furnace is a vital part of the whole set of machines. In general, our wood carbonization furnace has adopted the latest technology and reasonable structure to increase charcoal yields and reduce the carbonization time. 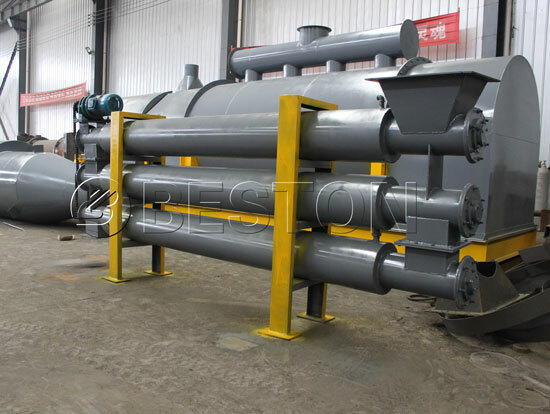 Beston wood carbonization furnace has used the design of double layers that can make sure the hot source can contact with raw materials as much as possible. According to the research and constant tests of our technicians, the hot source can be recycled to heat raw material for several times from the beginning during the whole wood pyrolysis process, which has largely increased the working efficiency. On the other hand, This design, also called the horizontal type furnace, can also avoid the hot source touch the bottom of furnace directly, so that it benefits to extend the service life of the whole biomass pyrolysis plant. 2. Well refrigerating system: due to the high temperature of finished charcoal, it is too dangerous to be exposed to open air directly. At this time, we can use refrigerating system or cooling system to decline the temperature of charcoal to 30℃, so as to guarantee the security of machines’ operation. 3. Efficient spay dedusting system: in addition to wood charcoal, wood chips will also generate combustible gas in carbonization furnace. Combustible gas has high caloric value, so it can be used as fuel to provide heat energy for furnace and dry device. 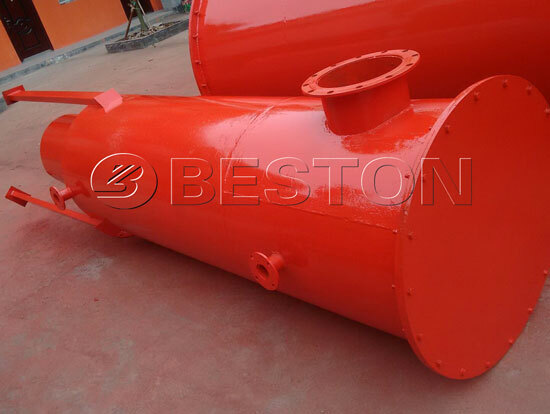 But it also contains a sulfur component which can cause serious environmental pollution, so Beston wood chip charcoal making machine has installed spay deducting system, which can fully remove the harmful components of combustible gas to achieve green production. 4. Refined condenser system: after purified by spay dedusting system, the cleaning combustible gas will be conveyed to condenser system to extract tar and wood vinegar, and these materials both have high utilization value. With strong wear resistance and high corrosion resistance, they always can be used as chemical additive to produce mosquito-repellent incense, chemical fertilize, pesticide, etc. 1. Simple and reasonable structure, easy to operate, small floor space, labor saving and power saving. 2. Equipped with dry device and crushing machine, so it can adjust the size and moisture of raw materials at any time, which can guarantee the quality of wood charcoal. 3. The main parts of the machine are made of wear resistant material with specific treatment that can ensure continuous production and durability of the wood carbonization plant. 4. Single machine with multiple purposes. 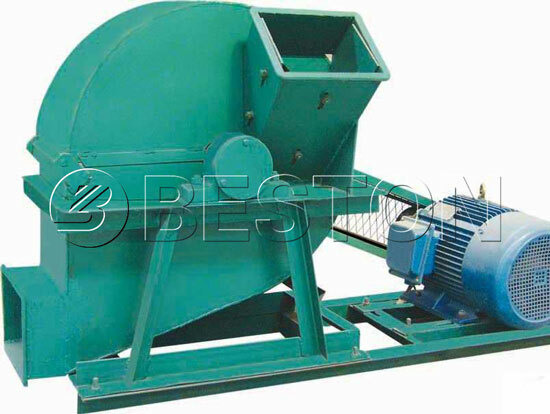 In addition to wood chips, the machine can possess other materials, such as rice husk, coconut shell, palm shell, bamboo, sewage sludge, and sorted MSW. In this way, we can help our clients gain higher economic benefits with the lower wood charcoal machine price. 5. The advanced forming wood charcoal carbonization furnace has reduced the friction between machines and raw materials, so as to greatly extend the service life of the whole set of machines. Why Choose Wood Charcoal as New Renewable Energy? 1. Smoke free: wood charcoal is burning without harmful smoke. 2. 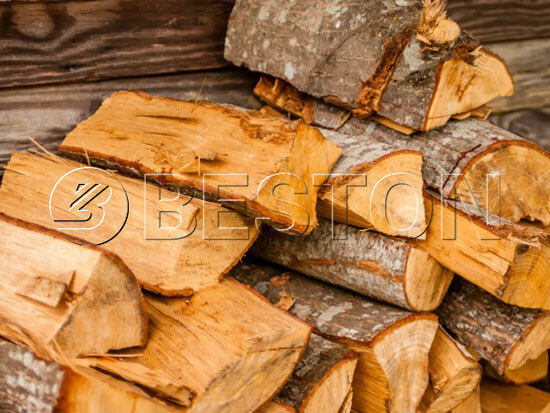 High carbon contents: charcoal from wood has high carbon contents so that it has higher caloric value than coal. 3. No odors: wood charcoal contains little steam components, which can eliminate odor and reduce pollution. What’s more, the wood carbonization machine also has been equipped with the spay dedusting system to remove sulfur components. 4. Long burning time: the using time of wood charcoal is as twice as coal. 5. 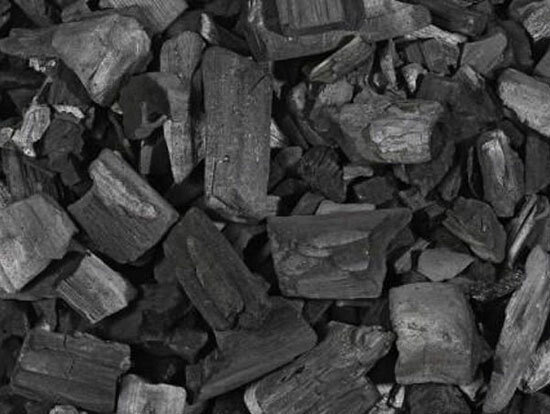 Excellent quality: wood charcoal has fine density and smaller fissures, which has also decided its higher caloric value. 6. 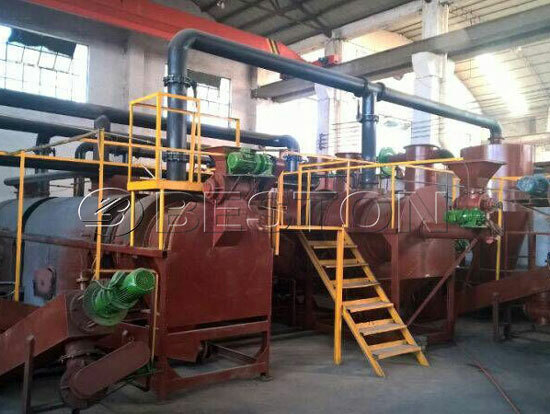 Environmental protection: Beston wood charcoal making machine for sale mainly uses wood chips as raw materials, which can not only realize the goal of turning waste into treasure but also has solved the serious environmental pollution and achieved resource recycling.